Though it's pricey, Dog & Bone's LockSmart is an impressive, reliable device that will change the way you look at padlocks forever. Padlocks have always been pretty straightforward, haven't they? Simply lock one up and keep its key in a safe place so you can open it up again. Not much more to it, is there? Actually, there are a number of ways in which padlocks can evolve in order to provide expanded functionality and ease of use. For starters, you have to get new physical keys made and distributed if more than one person (i.e. a friend, housemate or family member) needs to access what's behind the lock. You also have to keep a key on you or nearby in order to unlock it regularly, and really, who needs or wants another key to carry around? Personally, every time I want to leave through the back door of my house, I have to walk inside, find the key to the back gate, walk back outside, unlock the padlock, walk inside and put the key away again, then come back out in order to pass through it. That's a whole lot of back-and-forth to achieve an extremely simple task. With the rising popularity of smart home accessories that apply wireless functionality to relatively mundane items, it makes sense that a padlock would be next. With that in mind, the idea of keyless Bluetooth padlock that I can unlock with my phone (which is on me almost always) starts to seem like a perfect solution to all of my first world problems. 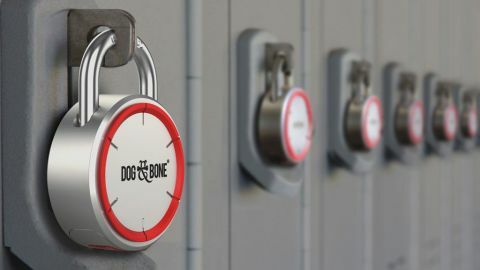 Dog & Bone has created exactly that with its LockSmart Bluetooth Keyless Padlock, and it's managed to do so with only a couple of minor downsides. As you'd expect, Dog & Bone's LockSmart is a hefty piece of kit, with the kind of weighty, solid build that you'd want from something that keeps your possessions safe. It's got a tough stainless steel shackle and a die-cast Zamak-3 zinc alloy body, giving the padlock high tensile and impact strength. Red rubber bumpers on the front and back of the padlock provide some protection for your belongings while also giving the LockSmart a bit of added style (surely one of the most important factors in deciding which padlock to purchase). The LockSmart is also weather-proof, so leaving it out in the rain, hail, or extreme cold is no issue. On the bottom of the lock is a red rubber flap which opens up to reveal a micro-USB port for charging the device and a button you'll need to press to sync the lock to your phone and also wake it (it turns off completely when not being used to conserve battery – more on that later). Though it's quite obvious (being a keyless lock and all), it should be noted that the lock does not have a keyhole or any form of key activated unlock mechanism. In terms of security, Dog & Bone's Bluetooth padlock provides 128-bit advanced encryption, as well as a 256-bit cloud generated private key, which admittedly won't do a lot against a pair of strong bolt cutters. Still, at least you know that your stuff will be safe from bolt cutter-less hackers.